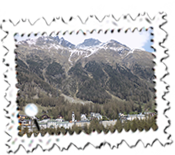 I had made use of the Swiss Railways (SBB) reduced-priced tickets to book to Pontresina. 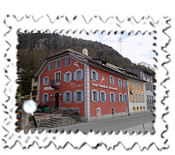 These are available a month before travel and can save up to 50% on the normal fare and, after a wonderful journey including a brief trip over the high and impressive Landwasser Viaduct, was at the Hotel Steinbock just after 1 pm. Even for the end of May, I was surprised at how quiet Pontresina was so a lot of places were closed but the Steinbock was a treat and very convenient for the bus around the Engadin area. The reason for going again to this area was to follow a hunch. Last year, I had gone to the Forno Glacier having read that the parachutists in the earlier part of Where Eagles Dare had been deposited there. 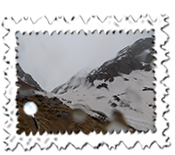 Whilst walking to the glacier, something had caught my eye and looked – possibly – as if it could have been the part, in the first couple of minutes of the film during the credits, that the plane had veered off to the right and over a mountain range. Something looked familiar and so I went back to Maloja to check it out. It wasn’t, sadly, a good day. I was slightly caught out by the amount of snow still on the slopes but, more pertinently, by the persistent rain. 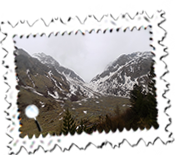 I was properly shod and warm enough but was badly drenched by the time I reached the Muretto Pass which was where my hunch lay. Having got so far, I didn’t want to be deterred by the rain or snow on the higher reaches so gave it a go. It didn’t look demanding but, when I eventually had to turn back, the view down showed that I had reached a decent height. And, oh dear, carrying my glasses in one hand, stick in the other, red cap which, badly wet, caused havoc staining my clothes and trying hard to avoid the snow by scrabbling up rocks! It was just as well that I saw no-one else during the three and a half hour walk. I am sure that fans of the film remember the scene where Mary Ellison tells Major Smith of his “insane missions” and that he is too old for them after he had climbed the exterior wall to effect entry into the Schloss Adler. I know how he felt! It wasn’t the slope that did for me but trying to cross the water to reach the other side. It was more than a stream but less than a river and, being uncoordinated, could I find a way over? It took ages which I didn’t really have being saturated by this stage. When I did make it in a graceless manner, my boots were soaked and, so relieved I was to make it, I promptly went, how I can put it, base over apex and on my back. Somehow, I made it to the earlier bus by the very skin of my teeth and, with a better connection back which was both a surprise and a treat, I was able to recuperate in the spa attached to the Steinbock. I still can’t say whether the exertions I put myself through made me feel any more confident whether the early part of the film was shot over the Muretto Pass. Something, of course, wants to believe it but, looking at it realistically, something also looks familiar. Had I been able to get to the top, I could make a better call. My short trip ended the next day. The weather was, if anything, worse and I was grateful for the Steinbock offering me a lift to Pontresina’s Railway Station. 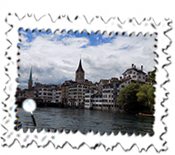 I stopped in Zurich for an hour rather than get to the airport far too early and had a wonderful time near the picturesque Limmatsquai close to the station. 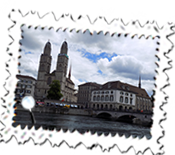 I have been visiting Switzerland for over thirty years but have rarely seen Zurich. Needless to say, I have missed a nice area until now and was pleased for the brief visit. Needless to say also, the return flight was also delayed so I was only back later than hoped for after a brief but enjoyable trip. Further news soon afterwards was a package from California. I had tried my luck by sending two Where Eagles Dare postcards to Clint Eastwood asking if he would be happy to sign them and return in the pre-paid envelope ( bought in Dallas on my way back from Peru last November). 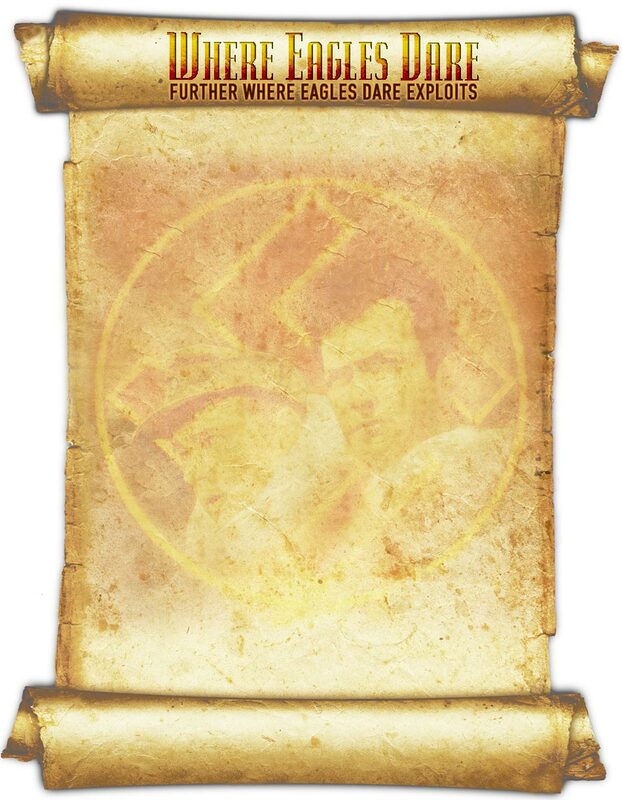 The cards were there, unsigned, and a separate envelope, postage paid by the sender, included a signed photograph by Mr. Eastwood from another film. I was touched and was the envy of my colleagues.